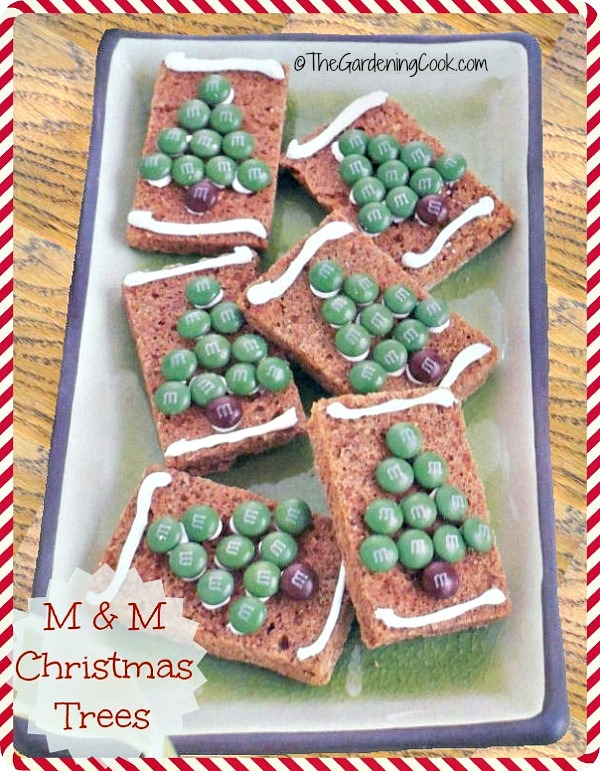 These cute M & M Gingerbread Christmas tree cookies will make a great addition to your Christmas buffet table. They would also be great for your annual cookie exchange. Gingerbread is a common taste during the holidays. From cookies and houses made of gingerbread, there are lots of options. See my tips for the perfect gingerbread house here. I love making cookies this time of the year for cookie swaps. Another great Christmas cookie recipe is the one for lemon snowball cookies. They bring out the holiday spirit just like these M & M gingerbread cookies do. 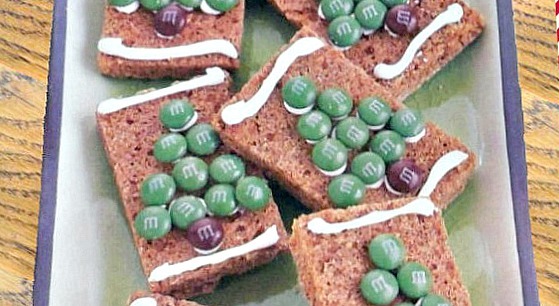 The Cookies are made by using a packaged gingerbread mix, frosting and M & M candies. The tree is just one idea for decorating them. Let your imagination run wild. You could make bells, Santa Faces, ornaments or any other festive images. 12 oz package of holiday colored M & Ms I used green and brown but colored ones would look like ornaments. The recipe is super easy to make, too. Once the gingerbread has been, cooked, cooled and cut into rectangles, just arrange Christmas tree shapes and decorate with a swirl of white icing on the top and bottom. Cooking takes just 20 minutes plus decorating time. You will get 20 bars and they are about 200 calories each. Wrap the bars in red cellophane for a festive way to store them. This makes a great hostess gifts or is a super cute addition to your annual holiday cookie swap. Preheat the oven to 375º F. Line a 13 x 9" pan with aluminum foil, and then grease the foil. Prepare the gingerbread mix according to the package directions for gingerbread cookies. Press the dough into the prepared pan. Bake for 12-15 minutes. The mixture will be set but not firm. Cool on a wire rack for about 20 minutes. Invert the pan and peel off the foil from the gingerbread. Trim the edges slightly all around the piece. Cut the gingerbread into strips, making 20 bars. Place icing in the middle of the squares in the rough shape of trees. Add the M & Ms in green color for the tree and a brown one for the base. Using the tip of the icing swirl a top and bottom line for the frame of the cookie. Allow the icing to dry completely - about one hour. Wrap each bar in red cellophane to keep fresh.